Your big day is one of the most special times in your life, and your wedding invitations give your guests their first impression of your wedding. Just like your big day, your invitations are also extremely special, and you want your guests to be excited when they see them in their mailbox. Before your guests even see your invitations though, they'll be seeing the envelope that holding it inside, and imaging your guests' surprise and delight to see a beautifully calligraphed envelope among the rest of their mail. It's a cherished reminder of the fun celebration to come, and it sets the tone for your wedding day. Of all the other mail in their mailbox, your invitation should command the attention it deserves. Not only will the custom calligraphed envelope surprise and delight your guests, it will also make them feel special. In our digital world, there is nothing quite like receiving handwritten mail these days, and receiving a piece of mail that has been given extra special attention will mean the world to your guests. It will make it clear how much they mean to you, and that they were truly worth the effort. On top of making your guests feel special, you'll in turn also get lots of compliments and remarks from your guests about how thrilled they were to receive such a beautiful piece of mail and how excited they are for the big day, which is always an amazing feeling. While you can always get your addressed printed on your envelopes, it's considered good etiquette to have them hand addressed. It is highly discouraged to use labels, as it often looks both lazy and tacky. Additionally, an experienced calligrapher will know good etiquette for addressing your envelopes, as it can be a tricky process (i.e. how to use distinguished titles, addressing children and families, etc.). As a bride, you will be extremely busy planning the many details of your wedding, and addressing envelopes takes time. And if you hired a custom stationery designer for your invitations like I recommended in this post, your calligrapher will be able to use their creativity to make your invitations and envelopes look cohesive together, which is another thing you won't have to worry about in your planning process! 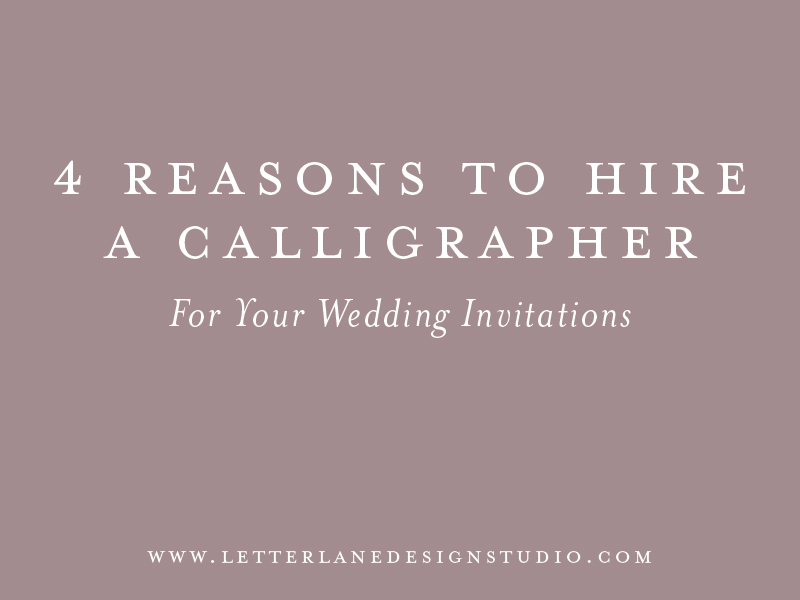 In the end, hiring a calligrapher may seem unnecessary or even a luxury, but truthfully, custom calligraphy will help enhance your beautiful invitations and make your guests feel so special and excited for your big day, as well as getting rid of an item on your long to-do list. Calligraphy holds a truly special place in my heart, and is something I absolutely love offering to my brides. If you are interested in calligraphy for your wedding invitations or envelopes, I'd love to chat! Thank you! You will receive an email shortly with your download after you confirm your subscription!